(1) Deep motherf#cking ideal customer research. (2) Then mapping this to a chain of beliefs. (3) Within the frame of a presell site (and network). (4) Then exposing people to this through a story narrative. (5) That connects with their story. (6) And rewrites the ending within a frame you control. (7) Where you earn their attention. (9) Right into your email funnel. (10) Where you get to build trust, deepen rapport, and influence their beliefs and behavior in your direction. ON TUESDAY (MARCH 7) I officially get labeled a year older. The big four-four. Which is the reason for this page, and this one-time only special offer. Each year on my big day I like to offer a ONE DAY ONLY special. For the past 5+ years it’s always been a 50% discount for ARM. This year, however, I’ve decided to do something different. … of how I’ve attracted people into my fold, rapidly bonded with them, and turned them into SUPER-FANS (meaning they buy everything I put out). Over the years I’ve streamlined the process, as the elements have become clearer to me (truth is, as a creative, I’ve not always fully understood why my approach works so well, other than IT JUST DOES). But over the past 2-3 years I’ve gained a level of clarity and insights, to the point where I felt I can now (finally) start the process of “codifying” what I do into something others can follow (and replicate the results I’ve achieved). The result of this initial “brain dump” is what I’ve called Sphere of Influence—The Art of Invisible Influence. … and I shared it with a small cohort of people within our private community. I shared it with them in an effort to extract their feedback, and then improve how I articulated and sequenced the training. (tips hat to @Andre ). VERY well done sir. In the 3 years since I niched myself down into providing IM services (ranking, conversion, lead gen) to roofers, I’ve been thinking about the “Frank vs Matt” example and fleshing out the characteristics of each. @Andre – Just finished this training. Well done, Sir! I need to expose a few more people to this. Between now and 2018 I want to “fine tune” it based on real feedback and in-the-field testing (outside of my own head, and how I’ve been applying this for over a decade). Ultimately, because the nature of this content is so esoteric, I only plan to teach this within a LIVE online project-based workshop setting. The first one being early 2018. This is why, as a ONE TIME DEAL for ONE DAY ONLY, I’m offering access to this at a fraction of the price I’ll be charging for the live online workshop. You win (around 15x cheaper), as do I (what I value now, more then money, is FEEDBACK). … read EVERY WORD of the copy in both the price tables below. I know some of you will just order blindly because this is something new I’m putting out, and you buy everything of mine. I’m humbled by that … but please, read all the copy before buying. It’s important so that expectations are clear. I’m looking for people who won’t just buy this because it’s 15x cheaper, but do nothing with it. I want (need) the feedback, and I expect everyone who buys, to be on-board with that. NOTE: The BUY BUTTON will be activated all day on March 7, and be TURNED OFF (for good) at 11:59pm Pacific time. If you do have questions, you can reach me here. * DELIVERED: Live (via Zoom) and Project-Based (read: execution is REQUIRED). * OUTCOME: You’ll build out a Sphere of Influence Funnel (see below), then expose people to it. WARNING: This is not (read: not!) about bribing, coercing, bullying, tricking, or persuading people to buy stuff they don’t want, need, or which doesn’t leave them better off. SOI is all about heavily front-loading value through the Advanced Strategy of Preeminence (BEFORE any value-exchange), that then works to ATTRACT AND PULL people TOWARDS YOU. They then PURCHASE as a RESULT of you doing the former well. This is how SUPER-FANS are attracted and created. Fans that buy everything you have, and spread the word about you to their sphere-of-influence. * ONLY AVAILABLE FOR PURCHASE ON TUESDAY, MARCH 7 (2017) SORRY, ENDED! * The CURRENT version of the content is 90% long-form text, which is ROUGH & INCOMPLETE (this current version is still my initial unedited “brain-dump”). * You’ll get ALL FUTURE UPDATES to this one-off SELF STUDY version, to the point that you’ll essentially have the same content as LIVE WORKSHOP, but without the live video interaction, feedback-loop, and project-based nature (where execution is REQUIRED). * You’ll be added to a private (secret) Facebook Group (so I can extract feedback, and help answer questions). * This is NOT a TRAFFIC course. Acquiring traffic is not covered at all, and this won’t change in the future. Your ability to ALREADY acquire (high-quality) traffic (free or paid) is a PREREQUISITE and PRESUMED. * This is not MAGIC. If you’re seeking out a magic-bullet, this isn’t it, and this training is definitely not for you (read: DON’T BUY!). * You’re an EARLY ADOPTER by nature (read: you’re OK with buying something that’s incomplete, and helping make it better through execution and feedback). * You’re ABLE and WILLING to (1) WRITE COPY and BUILD stuff that’s IMPERFECT, (2) give FEEDBACK, and (3) work to IMPROVE your results through a process of iteration. * If you’re an ACTION TAKER, not just an INFORMATION JUNKIE. * You CARE about building an AUDIENCE worth serving & MATTERING to. SORRY, SPECIAL OFFER HAS ENDED! QUESTION: What’s the difference between ARM and SOI? ANSWER: I’ll keep this very simple. ARM is all about email (everything that happens AFTER someone adds themself to your email list—it does NOT cover any list building). SOI, for the most part, is everything that happens BEFORE the opt-in. then using email to deepen and extent that relationship over time. Both SOI and ARM are strategic frameworks that I developed after been exposed to Jay Abraham’s Strategy of Preeminence back in 2004/05. In a nutshell, SOI is all about creating marketing that affects what people NEED to BELIEVE, REALIZE and AGREE to in ADVANCE, before they can ACCEPT the NEED for the product or service you have for sale. 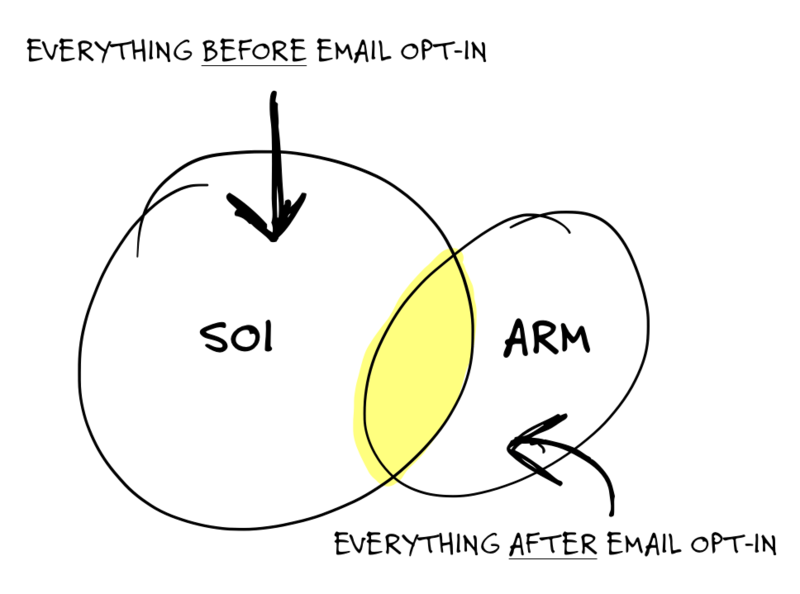 The YELLOW intersection of the Venn diagram above is where SOI and ARM overlap, in the sense that email is the perfect delivery vehicle to use (extend) SOI, to change what your audience need to believe in order to move closer towards you (your ideas, products and solutions, etc). QUESTION: What is the format of SOI? ANSWER: 90% of the training is long-form text (published as web-content) written by yours truly. There’s also about 2 hours 50 minutes of video (two presentations; one of Todd Brown, one of Rich Schefren, both taken from Todd’s $10K Big Idea Bootcamp which I attended in January 2015 — & Nate Dye does a video debrief on one of the more complicated lessons).